The nightmare bugs are multiplying because our antimicrobial team has no real leadership and has shockingly inadequate funding. We don’t have much data on what is really happening, but my guess is the deaths-from-resistant-microbes curve is increasing at an increasing rate. Every year more patients discover that the post-antibiotic world has already arrived for them. Dr. BRAD SPELLBERG: It’s not that the government agencies are not aware of the problem and are not— and are not doing anything. It’s that we have not had a comprehensive plan for how to deal with antibiotic resistance. We don’t have reporting mechanisms, like they do in Europe, to know where resistance is occurring, who’s using the antibiotics, are we overusing them? DAVID E. HOFFMAN: Wait. You’re telling me we don’t know the answers to the extent of the problem? Dr. BRAD SPELLBERG: That’s correct. DAVID E. HOFFMAN: We don’t have the data? Dr. BRAD SPELLBERG: That is correct. I do not know how many resistant infections are occurring right now. I don’t know what the frequency of resistance in different bacteria are. We do not have those data. NARRATOR: FRONTLINE requested an interview with the secretary of Health and Human Services, Kathleen Sebelius. We wanted to ask about the lack of data and the about the priority the department is giving to the new superbug crisis. But she declined to be interviewed. The “nightmare bacteria” have caught governments and public health authorities napping. They didn’t seem to notice that over the past twenty years the development of new antibiotics has collapsed. From the 2013 report by the CDC Antibiotic Resistance Threats this graphic illustrates that there is now almost no new antibiotic development. The fundamental reason for the collapse in new antibiotics is the pharma marketplace doesn’t reward developers enough to pay for the R&D and the drug approval process (USD $600 million to $1 billion for a new drug). Those numbers inhibit every kind of drug – but let through those that sell to the chronic patient markets (cholesterol, hypertension, …). A successful new antibiotic may be sold to a patient for 10 days, not 30 years like a hypertension drug. And sadly there is nearly no high level level focus on the new antimicrobial market failure. The PBS Frontline special is a useful introduction to this subject — with video, audio, transcript and a number of useful resource links. 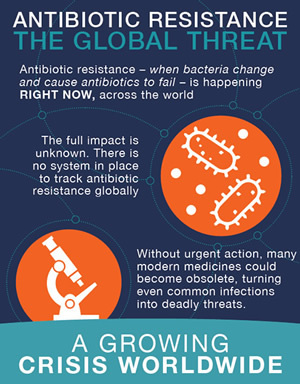 The CDC report Antibiotic Resistance Threats is an excellent, well-researched overview as of 2013. CDC has a Antibiotic / Antimicrobial Resistance websitethat can be your home base for researching and tracking progress on this issue. CDC is asking congress for $160M [Antibiotic Resistance Solutions Initiative — $160M: A Comprehensive Response]. So what can you do? Most important is to make it clear to your representatives that you expect them to support a major government focus. In the U.S. there should be at least an NIH Assistant Secretary devoted to antimicrobial resistance, whose mission should be new antimicrobial drug research and development, high-efficiency testing to fast-track diagnosis of new cases, case tracking/reporting, and OBVIOUSLY to radically slash the agricultural misapplication of antibiotics at sub therapeutic doses (about 80% by mass of US antibiotic sales). To give you an idea of how inadequate the US response is read Can a New White House Plan Catch Up to the “Superbug” Threat? Although that initiative represents the government’s first-ever attempt to broadly address the issue of antibiotic resistance, the plan has been quickly dismissed by some scientists and lawmakers for not going far enough. In an interview with Politico, Rep. Louise Slaughter (D-N.Y.), the only microbiologist in Congress, said that goals set for 2020 are too far off to make up for lost ground. PS – if you have some elective surgery on your horizon, say a knee or hip replacement, you might want to think about getting that done while there are still a few antibiotics that could help save your life (or your leg). Q: There’s a perception that vaccine refusal is especially common among affluent, well-educated, politically liberal parents—is there any truth to that? S.M. : It’s dangerous to make broad generalizations about a group, but anecdotally and from the overall data that’s been collected it seems to be people who are very actively involved in every possible decision regarding their children’s lives. I think it relates to a desire to take u ncertainty out of the equation. And autism represents such an unknown. We still don’t know what causes it and we still don’t have good answers for how to treat it. So I think that fear really resonates. Also I think there’s a fair amount of entitlement. Not vaccinating your child is basically saying I deserve to rely on the herd immunity that exists in a population. At the most basic level it’s saying I believe vaccines are potentially harmful, and I want other people to vaccinate so I don’t have to. And for people to hide under this and say, “Oh, it’s just a personal decision,” it’s being dishonest. It’s a personal decision in the way drunk driving is a personal decision. It has the potential to affect everyone around you. S.M. : I think it taps into the organic natural movement in a lot of ways. I talked to a public health official and asked him what’s the best way to anticipate where there might be higher than normal rates of vaccine noncompliance, and he said take a map and put a pin wherever there’s a Whole Foods. I sort of laughed, and he said, “No, really, I’m not joking.” It’s those communities with the Prius driving, composting, organic food-eating people. The image of a handsome doc doesn’t tell you anything about the quality of the medical information! The Cochrane Collaboration: this is a first stop for many physicians who need to check on what is the current best evidence-based information based on Systematic Reviews. If you need more, visit CAPHIS, the Consumer and Patient Health Information Section of the Medical Library Association. CAPHIS maintains Top 100 List: Health Websites You Can Trust. We have downloaded the whole database for easy reference. If you are a US or Canadian resident and you need a medical library, see Find a Library. a regular column in which Julia Belluz (a journalist) and Steven Hoffman (an academic) join forces to tackle the most pressing health issues of our time — especially bugs, drugs, and pseudoscience thugs — and uncover the best science behind them. Incidentally, prof. Bryan Caplan is the author of one of our favorite Public Choice books The Myth of the Rational Voter. For more background try my post Public Choice: rational ignorance, pork and rent-seeking. How will we know if the ACA is working? I don’t know the answer to these five concise questions formulated by Tyler Cowen. Do you? 1. Five to ten years from now, how much do we think employment will have gone down as a result of ACA? (That is from the employer mandate, high implicit marginal tax rates because of the subsidies, and also from a lesser need to stay employed to have health insurance.) By the way, you can’t in other contexts believe strongly in rigidities and then confidently point to a small employment response within a one year time frame and claim to know these labor market effects are small ones. 1b. How will the effort to introduce greater equality of health care consumption fare if wage and income inequality continue to rise? Will this attempt at consumption near-equalization require massively distorting incentives? 2. Given your answer to #1, and given how much employment itself boosts health, will ACA even have improved overall health in America? Whatoutcome indicators might show this? 3. Given that prices in the individual insurance market already seem to have gone up 14-28 percent, and may go up more once political scrutiny of insurance companies lessens, what is the overall individual welfare calculation from this policy change? I mean using actual economic policy analysis, of the CBA sort, not just noting that more people have health insurance. 4. Given supply side constraints, how much did ACA increase the consumption of health services in the United States? (I take the near-universal bafflement over the first quarter gdp revision a sign of how poorly we understand what is going on.) And how good or bad a thing is the ongoing but accelerated shift to narrow provider networks? 5. How much of the apparent slowdown of health care cost inflation is a) permanent, b) not just due to the slow economy, and c) due to ACA? Or how about d) the result of trends which have been operating slowly for the last 10-20 years? I have lifted Tyler’s complete post to serve as a checklist for monitoring the results. It will take a while – especially solid outcomes data. It isn’t at all obvious how the outcomes can be measured.